Brent: As a sculptor you work fairly pure, neither adorning pieces with mounts nor placing your presentations on pedestals. If a “work” sits on the floor and only grows to somewhere around or below the knees, well, that is where it sits. One vice I have is a passion for the decorative. 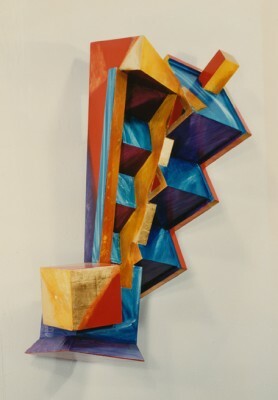 For a brief period, around 20 years ago, I threw 22k gold leaf on my sculptures and sometimes glazed it with color. I learned a lot about pigments and transparency that way and then got over it. Now, I employ that love of decorative surface to create allusions to functionality. Veneers make the sculptures look like furniture and that confuses expectations. 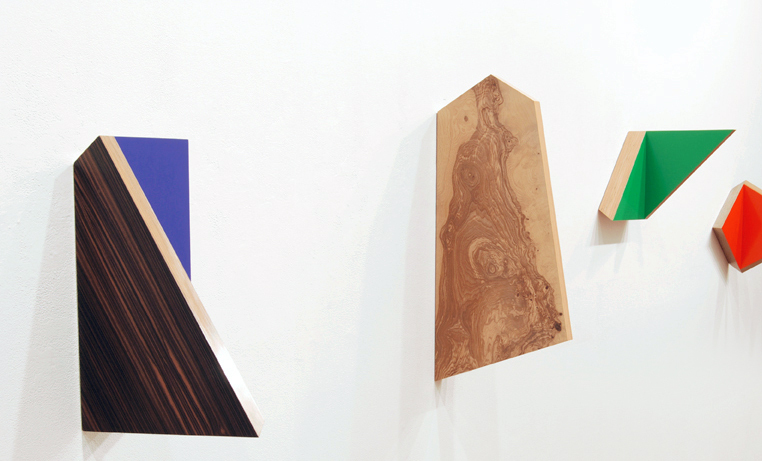 Figuration in a veneer also initiates visual activity that I can play with in the form of the sculpture. Richard: I like your comment about color “greater than the inches it supports”. When I have used solid areas of color. They are underpainted and glazed, resulting in 15 or more coats. This is to make the surface interesting and mysterious. In the “Profile” sculptures, I was pleased to discover that the perpendicular configuration bounces light between the angled planes and the glazing creates a virtual space that is practically gelatinous. Now that’s interesting and mysterious. Brent: And plastics, colored, textured, and translucent. Richard: I used plastics long ago in grad school for purely architectural reasons (the sculptures looked like buildings). Now I’ve started to play with the stuff again and I haven’t really mastered it yet. Viewers enjoy the shadows cast by my wall sculptures. The tinted, textured acrylic I’ve been using creates colored shadows on the wall that are more predictable and merge concretely with the built sculptures. That interests me a great deal. The pieces also start to look more literally like buildings again and I have to decide if I want that. Technical issues of attaching the plastic to the wood structure in an inevitable way have also not been solved. That, along with the radius created by bending the acrylic sheet to wrap around the form in some works, can make the whole assemblage look tortured and not inevitable at all. Lately, I’ve been very conscious of using as few elements as possible to create the most change and movement the sculptures. Sometimes I even count the pieces of wood in the construction to keep the number down. So far, wood and color work well. Adding a third element, acrylic sheet, does start to “spoil a sense of the pure”, and it will require a great deal of exploration before I am comfortable with it. Richard: I’m very conscious of simplifying things so that I can get maximum amount of activity and change in the sculpture with as few elements as possible. 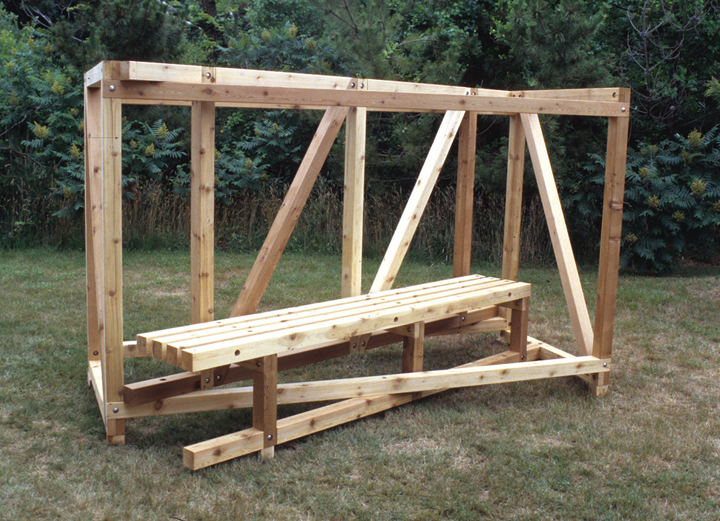 It is my goal for the viewer to be presented with a construction that reveals itself entirely in form and joinery in a very short period of time. At the same time, what is being presented should be utterly enigmatic and difficult to read. Walk around it and the other side is completely different. All that with just a few pieces of wood cut in a few angles. I love clarity and pairing it with deception makes it more precious. Brent: You said you have “a passion for the decorative” and then wanting the simplest state. Isn’t there a conflict? Richard: After going (briefly) crazy with decorative surfaces in the early 90’s, I backed off and then returned to use them very judiciously. 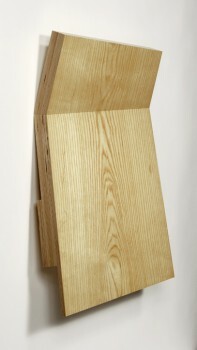 A strongly directional wood grain in a veneer sets up movement in a sculpture that can enhance or contradict the form. There is also the subversive reference to the functional (furniture). I finish the wood with a water-based polyurethane varnish because it does not exaggerate the iridescence and color of the grain the way an oil-based finish would. The decorative quality of the material hits just one note, and then it’s over. There is just enough low-key surface fun to keep it entertaining, but not overwhelm. Brent: In your wall piece “Profile #8”, 2007 the experience can’t readily be taken in from any one view. Something quiet small, under 20 inches, keeps declaring itself differently not simply because there is a color aspect, a grain, a thickness, along with the lines that make up the Birch ply strata… it is because the design can lead a view to misalign with the expectation of the next, and a confirmation of the last – to coordinate a vast and logically inoperable read. We can count, but numerals seem less important than the position we need to take, to shift to take in the shifts. I sense much more than “one note, and then it’s over”. Richard: The direction and energy of the grain is extremely important to me. The “one note” I spoke of is the decorative quality of the rich color and flame (iridescence) that accompanies the grain. I try to handle that with economy. Your response to “Profile #8” is right on. 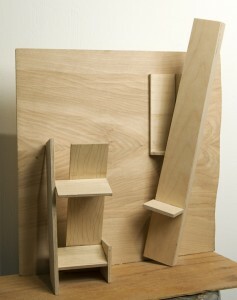 The “Profile” sculptures began with the simple configuration of two boards, joined at right angles and hung on the wall. The surfaces, contours and edges of the boards were then manipulated in the service of an animated narrative that defies the austerity of the format. An interesting portion of the veneer (Olive Ash Burl) was chosen and cropped so that the contour of the veneered shape appeared to be “engineered” by the swirling grain. 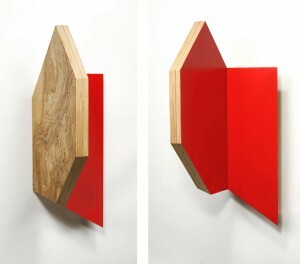 This polygon, laminated to plywood, became the plane perpendicular to the wall – the “profile”. The adjacent plane was shaped to comment upon the “profile”. Resolving the transitions in the edges between the two boards further modified their contours. One is presented with the figured “profile”. Forced perspectives create the illusion of movement as one walks by. Portions of the interior painted plane peek over the edge and pull you around. The interior planes of saturated color then flatten out and tell you a related, but entirely new story. Hopefully, each new chapter is a complete surprise, but also inevitable. That is why some of our friends who have actually seen the sculptures still leave a little baffled. It is not evident in the photos, but the plane that is flat against the wall is twice as thick as the veneered plane, the edge is beveled and not visible. This further disengages the painted surfaces from their support as they hover in front of the wall. Brent: I like that you make scale models: Do you figure the color and the grain into these? Richard: For the 10 “Profile” sculptures, 5 of which employed the burl veneer, I scanned the chosen veneer sheets on a large bed scanner. The images were reduced by 50% and printed out in multiples. These smaller representations of the veneers were used in 1:2 scale models that were built, torn apart and built again in the process of reduction and resolution. at that point, the painted color was chosen intuitively to compliment the form of the piece. My goal with this series was to make my work less encumbered and more direct, using a simple right angle configuration. Oddly, some pieces, like #8, come across as even more baroque than my previous work. In the middle of this series, I was glad for the opportunity to do the installation at the Sculpture Center. Nothing very fancy could take place in a damp basement. While we have petted the illusionist play within the structural and its read, played with the deceit of the decorative, the inherent quality of material and its surface… we have yet to touch upon light. 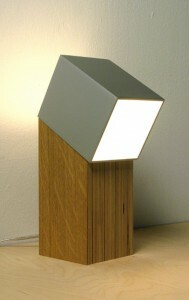 Richard: As mentioned, functional design informs my work and I am in love with lighting design. I have made lamps for myself when I’ve needed them. Putting light into the Sculpture Center installation was necessary in order to confront the site-specific issues there. The basement exhibition space at the Center is an environment that devours light as soon as it leaves the bulb. I had originally submitted my proposal for a wide, rectangular area and was going to have the light emerge from under box-like constructions on the floor. 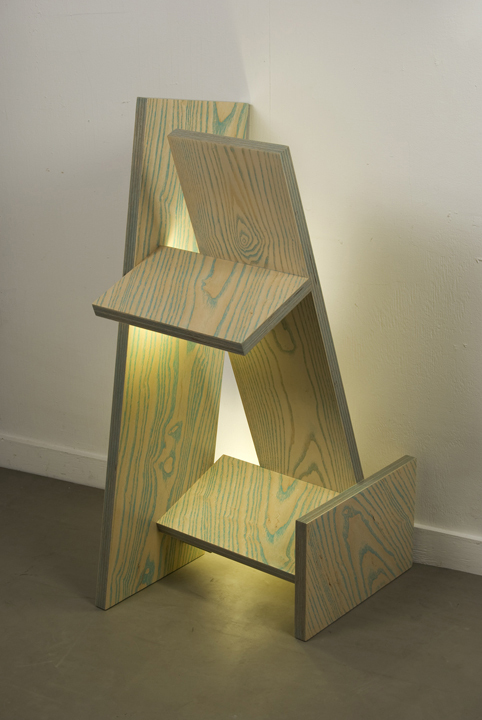 This would have been an unexpected light source in a space that is usually lit from above. At the last minute, I was given a corridor, 96 feet in length. This had been the electrical power plant for the building, which had been a trolley car repair facility at the beginning of the 20th century. The corridor was lined with beautifully made brick piers alternating with shelves and niches made of thick slabs of soapstone. Some white glass insulators remained fixed to the walls. A complete redesign was necessary and I had a little more than 3 weeks to do it. There was no floor space and I could not drill into the walls to hang anything. To install the first three hinged, painted constructions, brick piers had to be sheathed in plywood that was buttressed in place by those struts wedged between columns. There was no time to figure out how to incorporate light into these sculptures so they were lit with small spots, to my mind, an unsatisfactory solution. As I began to understand what I was doing, some of the rectangular voids were illuminated with fluorescent tubes and the last two constructed elements were internally lit. They pleased me a great deal. One was placed at each end of the installation, beacons inviting you in. 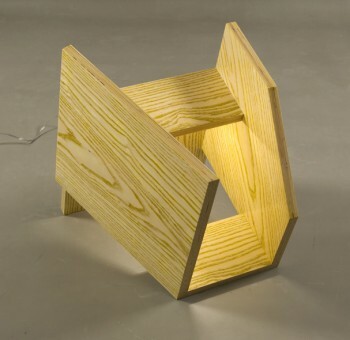 Brent: Interesting about the domestic lamp that you made. First thing that came to my attention was the cord. In a functional piece you need the cord, because of electricity, or the way we use electricity… so the functional object can’t function as art because the parts aren’t working with each other… for example a Flavin does because all the components work together. The fixtures are also the art. Richard: Ah, the wire! It is an issue in the realm of “fine art”. You may notice one snaking away behind “Gravity”. I know it should not be there. Matthew Deleget of Minus Space apologized for not hiding it at PS1. For some reason I think it is hilarious and the fact that it dangles so inappropriately behind the “pure” object gives me some kind of perverse pleasure. I realized that the piece should be installed on a low platform, the wire secreted away below, but it was to be shown in a basement area so I didn’t fret about it. Every now and then, I have the urge to include a detail like that, something that tethers the sculptures to our absurd reality. I suppose it’s just to amuse myself during the tedium of fabrication. I usually get over it and then clean up the details. Brent: The “Facade” series is very new, and they use this textured plastic. 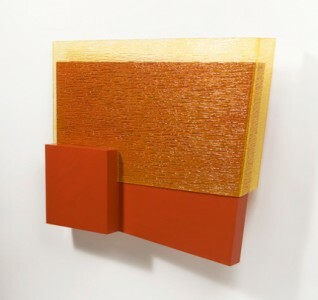 “Facade #5” 2009 is wood, acrylic paint, and textured acrylic sheet, no wires, no wood veneer, though plenty of illusion, and a good dollop of impurity, and it works –unsettling. The image reads square, but then you see the right edge, then you notice the rise in the underneath bottom green. It’s green: Green as green. The texture acrylic sheet is square? It reads not overly common but not high either, when you think of Judd… the perplexing planes and the kink at the corner suggests something similar to a Tony Delap. Richard: This is the fifth piece in a series that began as a specific image in a dream. This is uncharacteristic of how my work is generated but my teaching schedule is consuming and the subconscious part of my brain has been trying to be as helpful as possible lately. Sometimes I’ll go to my studio on a weekend when I’m free, drop off into a deep sleep I can’t fight off, and wake up with a really great solution to a problem. In this case, shortly after the school year ended in June, I woke up in bed one morning from a dream, and saw a new sculpture of mine in a group show. It was the oddest thing, a slab of brick red painted wood, partially wrapped in 1970’s textured amber Plexiglas. I’m usually suspicious of dream imagery because it is almost always about something else. The sculpture was so compelling though, within an hour I was online, and the on phone looking for the material. It was perfect timing. I had planned a group of sculptures that I was going to make in July, but August was free. The brain, in its wisdom, had set my course. In pursuing the “Façade” group, I found that colored textured acrylic is no longer in fashion and not manufactured. This was a good thing as the “rain” textured stuff had a good pattern and glazing it with acrylic color gave me more flexibility and better color. I made five pieces and only the last one came together aesthetically and technically. Some are too indulgently architectural; others were plagued by unanticipated changes in the thickness of the acrylic sheet and need be remade. There is still a problem in attaching the plastic to the wood in a subtle way. To my mind # 5 was the most successful of the “Façade” group. It is a thick slab of plywood, 15” high and 11” wide. The plywood is laminated with ash veneer that was unsanded when I primed and painted it, leaving the grain to assert itself through the color. I was thinking of the inexpensive exterior renovations given to the houses and storefronts that I saw when house hunting in working class neighborhoods. Because of this the surfaces surely don’t have the purity of a Judd. There is a stronger tie to the perversity of Artschwager in that textured green if we must go “fine art”. The upper left corner does bend forward and the whole slab is angled out a few inches on the left side, leaving the right vertical side close to the wall. The plastic is nearly square, the lower edge angled down to the left an extra inch or so. These angles create the most bizarre visual compression when viewing the piece obliquely. As you walk by it, the thing changes radically. The plastic also creates a shadow effect that I really like. When most people view my wall sculptures, they are very engaged by the shadows and imagine that I have engineered them while designing the piece. I think if them as “free gift with purchase”. Nice forms + good lighting = interesting shadows, nothing I have to consider, they are an easy bonus that comes from the process. With “Façade #5”, the shadow of the plastic hovers just behind the work and is tinted with color. It is completely integrated with the sculpture. I am controlling and creating it. This aspect of the sculpture fascinates me and I want to pursue it. Perhaps I will this summer when I have more time to immerse myself in the problem. The Tony Delap reference delights me. I am familiar with his work although I haven’t seen it often or recently. Back in the ‘70’s, I saw a show in New York of disk shaped paintings with iridescent, “California” surfaces. I wasn’t attracted to the painting aspect of them but the way the edges angled back, appeared, disappeared and mysteriously reappeared, entranced me. I’m sure the memory of that show stayed with me and influenced me. Your jogging my memory about this interesting artist makes me want to see more of his work. Brent: I noticed you have a drawing of #5. Is it a before or after… the completion of the work? As a drawing it gives a certain amount of detail that I couldn’t pick up in the jpg. It sort of demystifies the object, which I like. But, of course, it is in this beautiful mystery that is the boat! Richard: The drawing happened before the sculpture. I made a model for the first piece (seen in a dream). It looked surprisingly good. After that, I developed the idea in a series of very specific drawings. A few tiny models were made just to check things out. Five pieces were made. I like #5 enough to show it. I thought I’d be done for the summer after the series. The forms realized by this group then precipitated another group of larger wood-only wall pieces at the end of August and into the fall. The “Facade” series mostly acted as a catalyst for other works. It was a really intense period of R & D. If you need images of the Wood Fold pieces, I’ll send them. Two of them will be sent to Zurich for a show that will include Kevin Finklea and Max Bill (*sigh*) in March (At Forum Ute Barth). Funny, I originally saw the first Facade piece in a dream. It was in a show that included Kevin. In the end, the piece got made and the show will happen, although it is a cousin of the dream piece that will be exhibited. Brent: The “Wood Folds” not only sit without add of a synthetic color they also hug pretty close to the wall. “Wood Fold #1” counts two main planes. The back of the lower structure has a shoe that helps pull the plane off the wall. Bare and reduced with the slightest amendment for display, counting right down, how did this work figure as next the step after “Façade”? 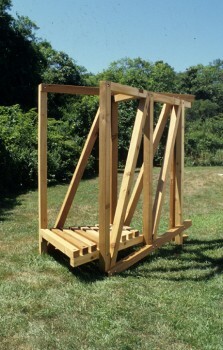 Richard: The “Façade” pieces were experimental in their use of plastic supported by wood structures. The wooden elements in this group became so intriguing to me that when they were complete, they suggested a whole new series of sculptures. I reinvented the “Façade” forms on a larger scale and with a more reductive format. I used more subtle structures and limited color, if any. I think that the “Wood Folds” became what the “Facades” were meant to be. To my mind, they are more resolved and they have a larger, more imposing presence. The “Wood Fold” sculptures were kept very low in relief because I wanted to get the maximum amount of activity with as little three dimensional extension as possible. This was an aspect of the reductive thinking and to a much lesser degree, a practical matter. People bump into wall sculptures that really stick out. I thought it would be good to follow the “Profile” sculptures, some of which project as much as 14” from the wall, with something much flatter. It’s a challenge and it builds the sculpture muscles. Brent: With “Wood Fold #3” the foot is topside, and is no longer a foot but an eddy. 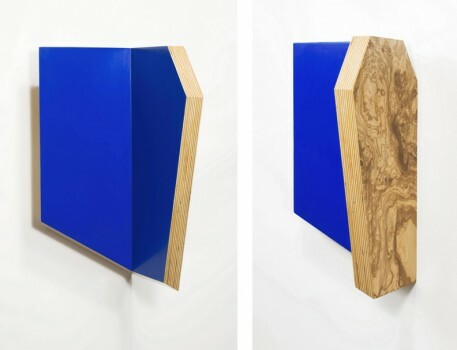 In “Wood Fold #1” it functions to distribute the planes to position in relation to the wall. In both cases there is something strange going on. To move this to the front reads as an anomaly, and as such functions even more as an oddity. Richard: The “foot” began as just a scrap of plywood I slipped under “Wood Fold #1” to support its weight during the final stages of fabrication. I looked back from the door as I was leaving and realized that the extra step was necessary for the reasons you mention in this and the last question. I was surprised that just a little jog could affect the piece in such an unexpected way. Ultimately, that layer change happens in all four of the “Wood Folds”. In #3 it plays with the lamination changes along the top edge, emphasizes the angle at which the piece is hung and creates a lovely little triangle of negative space with the angled plane on the right. Brent: Architecture has come up more than once in this conversation. You have also worked with outside sculpture. 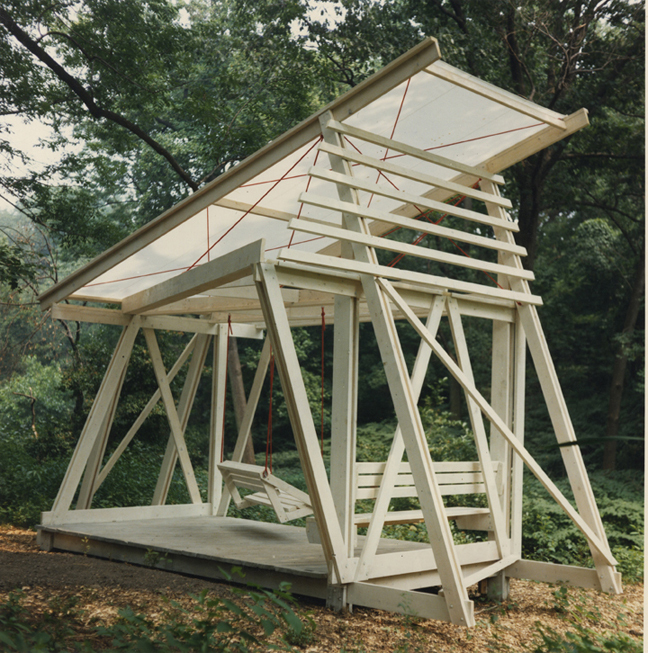 The first that I know of is “Swing Pavilion” made in 1987, and then a decade later with “Diagonal Bench” and “Ledge”. Are there any plans to go back to environmental sculpture in the near future, taking in consideration the new developments within your practice? 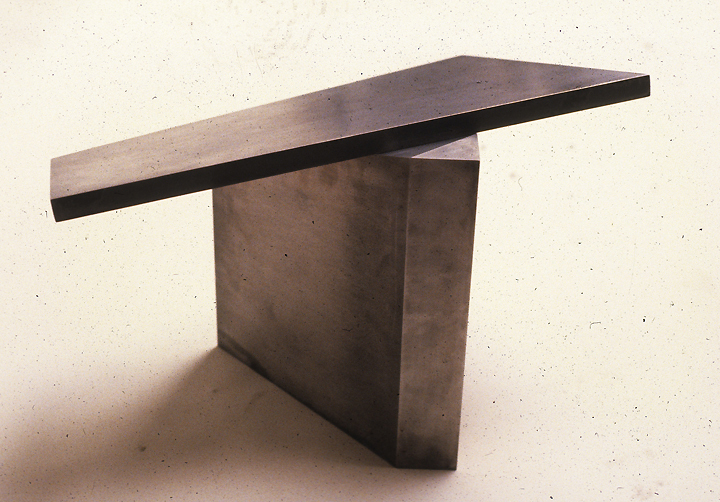 Richard: Architecture has always been my first love and a direct influence on my work. I can remember at the age of 3 or 4, lying in my bed and imagining that the windows in my room were in a different, more interesting configuration. That has never stopped. By the age of 9 or 10, I became aware of Frank Lloyd Wright and I was infatuated. Around 15 years ago, I finally pushed his decorative vocabulary out of my sculpture. You can see that influence in “Swing Pavilion”. When my work becomes architectural in scale, I believe that it should function as architecture. My long-term goal has been to create architecture on my own terms as a sculptor. All three of the installations that you mention were designed to be site specific. They lure the passerby in to sit down and then require that person to experience some disorientating geometry while looking at a carefully framed view. There is a stream just below “Swing Pavilion”. The bench swings up to the edge of the structure at an angle to give the participant a moment of vertiginous suspension over the sloping bank to the water. If you look up, there are layers of angled beams. It’s confusing but structurally very simple. I learned that bit from Frank L. W. Sometimes I think of my smaller wall and freestanding sculptures as a means to collect information that I will eventually incorporate in an environmental structure. 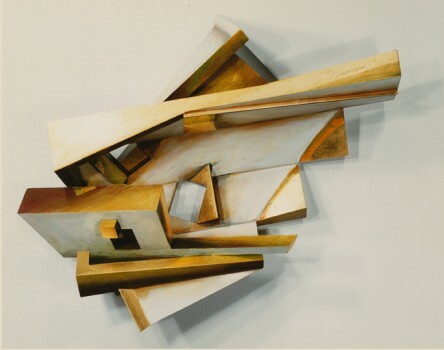 Tags: Architecture, Façade, Minus Space, Richard Bottwin, Sculpure, Tony Delap. Bookmark the permalink.